This post is sponsored by siggi’s. As always, all opinions are my own. Thanks for supporting the brands that keep Lively Table running! I have a new make ahead breakfast for all of you meal preppers that I hope you’re going to love – I sure do! Say hello to no added sugar mango turmeric chia pudding. Normally I’m not one to quickly jump on trends. I’m not super into ‘superfoods,’ powders or supplements. I prefer to just get my nutrients and antioxidants from real food that I can chew. And that doesn’t taste so awful that I have to disguise it in a smoothie and down it in 5 minutes. But I have been loving turmeric. Mostly because it actually does taste good and is easy to use in recipes. Do I think turmeric will cure all of my ailments? No. But I also don’t think that adding it to my chia pudding will hurt. And just look at the color it adds to dishes! 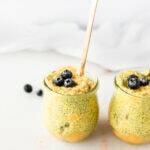 Just in case golden milk isn’t your jam, I made this mango turmeric chia pudding to taste more tropical. It’s got real chunks of mango, fresh ginger (which aids in the absorption of turmeric), and super creamy siggi’s no added sugar peach & mango yogurt. I’ve been loving the new siggi’s no added sugar flavors. They are ultra creamy and sweetened with just fruit, making them the perfect high protein snack or quick breakfast. 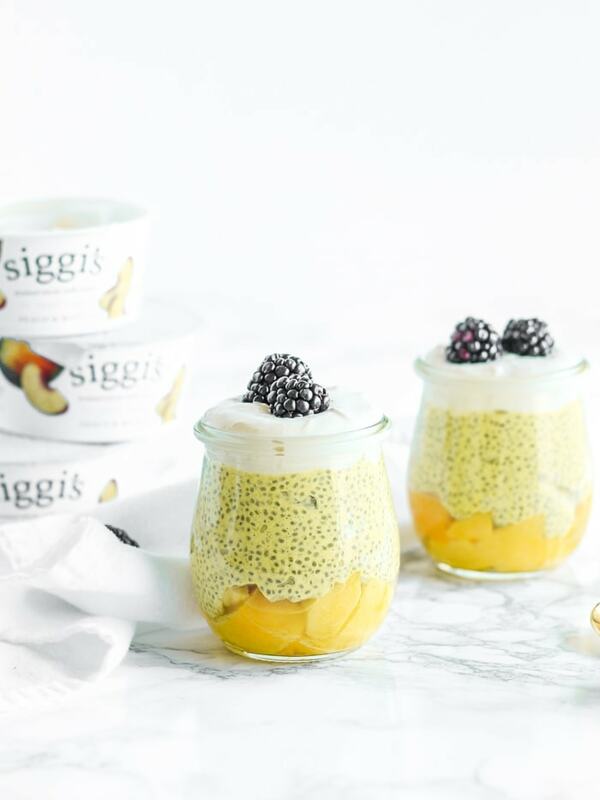 When you mix it with milk, chia seeds, and more fruit, siggi’s no added sugar peach & mango yogurt makes a dreamy breakfast that’s full of antioxidants and real, simple ingredients, all without added sugar! There is just the natural sweetness of fruit! 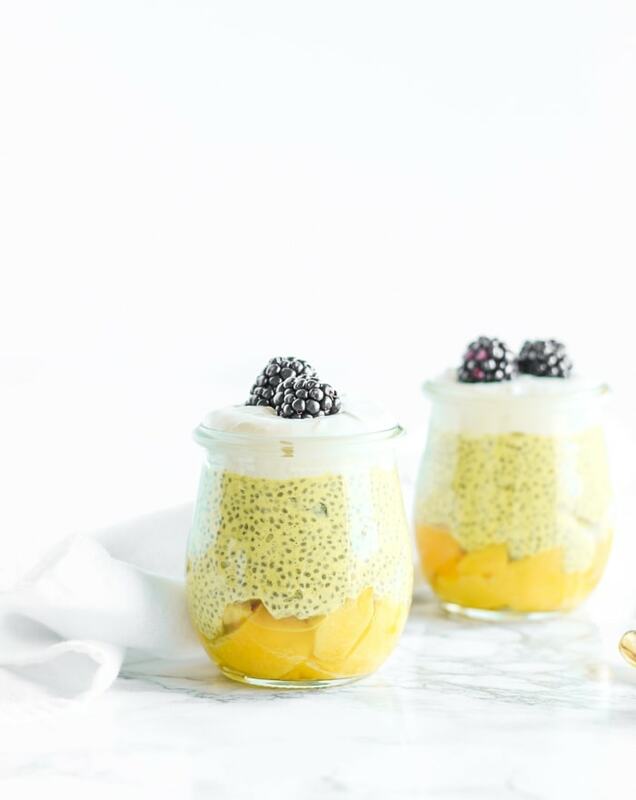 If you have some extra time in the mornings, layer your chia pudding with more mango and siggi’s to make a little parfait. Both ways taste delicious and keep you full for hours. Enjoy! In a mason jar or other glass container with a lid, whisk together yogurt, milk, turmeric, and ginger. Add chia seeds and stir to combine. Either add mango chunks directly to yogurt combination, or place in a separate jar in the refrigerator to thaw overnight, if you wish to create layers. Place lid on chia and yogurt combination and refrigerate overnight. Note: Since the siggi’s no added sugar flavors are fairly new, they are only available in select stores right now, mainly Whole Foods. You can use the location tool to find siggi’s in a store near you. Love the sounds of this recipe! Perfect healthy dessert for anytime! Thank you! Perfect for breakfast, snack or dessert! I’ve never thought to combine mango and turmeric but it sounds delicious! I love the tropical combo! Sounds so good Kaleigh! I too agree, I like to chew my food lol! Adding this to the list of simple ideas for nourishing me and baby! Thank you! Thanks Liz! They are super easy to make the night before and eat when you wake up! Love this use of turmeric! I use turmeric in chia pudding too – such a great way to add in some extra antioxidants! This looks and sounds so good! I love the combination of mango and turmeric. I’m with you – give me the food to chew rather than a supplement.